Try to verify the integrity of your game cache. Go to your Steam window and go in the Tools tab, and right click on Source Sdk Base 2007, then click on properties. There click on the Local Files tab, and click on the Verify Integrity of Game Cache button. This crash most often happens when ALT+TABBING the game, but it can also happen in very large areas with lot of combat happening. "Can't load lump 8, allocation of ******** bytes failed!!!" 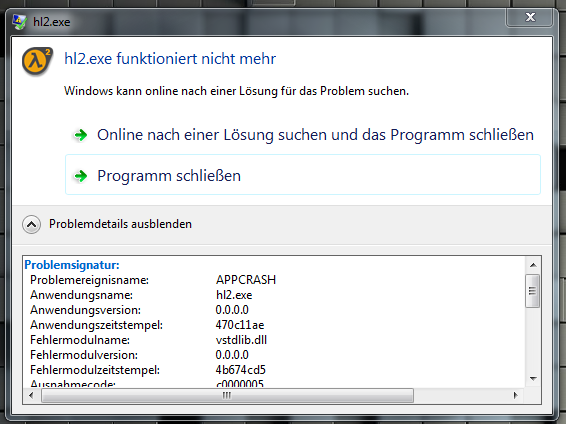 This is a very rare memory crash that happens after many hours of continuous play. This is a SteamPipe related issue, unrealted to the mod itself. Head over to your Steam TOOLS list. It seems underhell will crash if you try to run it on low settings, so I upped the settings and it work. Might not affect everyone. Turning the flashlight on seems to crash the game? The game keeps randomly crashing after I wake up in the bed, and walk downstairs. EDIT : I just figured out that the problem was due to the game being in DirectX 8. Switching it to DirectX 9 fixed the problem. Here's what I found: ABSOLUTELY, UNDER NO CIRCUMSTANCES, NEVER EVER USE MSI AFTERBURNER WITH THIS GAME. ITS DLL BLOCKING TECHNOLOGY WILL SLOW DOWN YOUR GAME DRAMATICALLY AND DISABLING THIS FEATURE HAS NO EFFECT. Will repost this info on my blog (it's pretty much my username with a .com) and I look forward to giving my viewers a good review of this game!! Figured out how to stop stuttering, may as well post my cure for the people who experience the same problem. The problem was that multicore rendering was blacked out in the options menu, every core was being used. Source doesnt really like multicore. 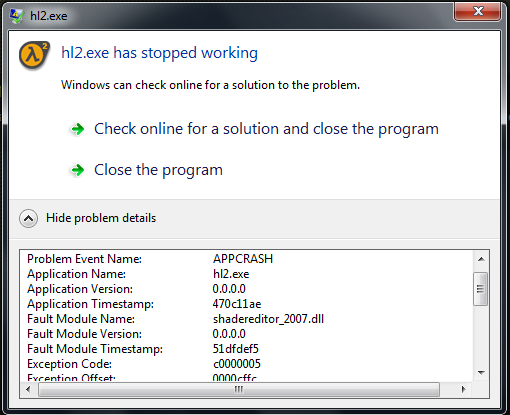 So I went to task manager, right clicked hl2.exe, "Set Affinity" and set it to just Core 1. Runs like a dream now. Caused by my save file or game bug, I don't know. I found doors. I got "Instruction at referenced memory could not be read", while pressing E (opening door). Always. Red Doors of Death? I attached demo file. So you will know which door. "could not be read" happened only with this door, I didn't find other objects causing this crash. I checked SDK Cache, I didn't ATL+TAB. We can not ALT+TAB the game because of "Too many verts for a dynamic vertex buffer" error. There is other way, fake full-screen mode. Of course, instead 1024 and 768 you can choose other values. Can't seem to figure out how to use the spoiler thing so don't read below if you don't want to know. 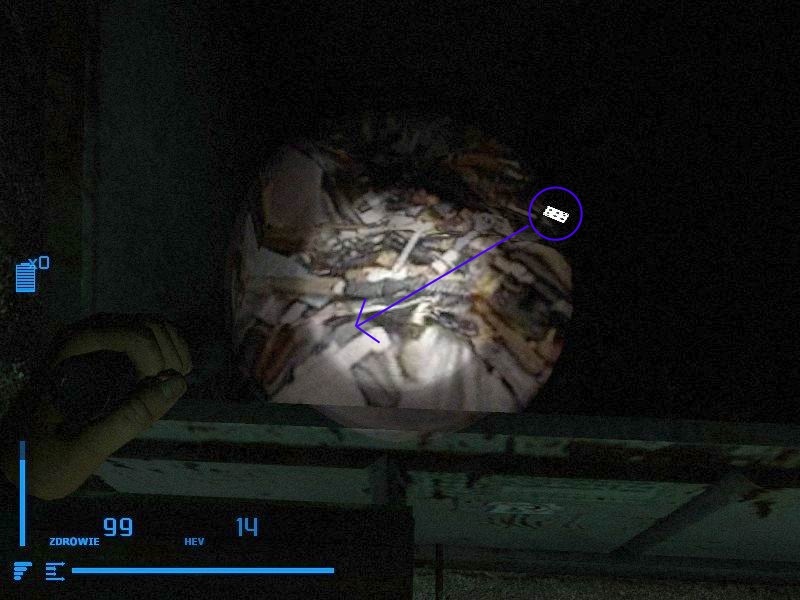 So after assembling the Cypher and making my way back to the safe room with the memory card, I face the front doors with Terry moving the bookcase away from the door, but with no animation, staring at me, and then walking back to his chair. The door won't open, and I'm unable to get back in the safe room, no matter how many times I've restarted or loaded previous saves, this happens. Anything that can be done? Ok I have a problem and its that when I load up the house I start at the bed I get out of the bed and I cant move I can jump and duck but I cant move I can look around using the mouse and its also at the part where it say to go to bed early I can even enter the bed and go to the dream world but I cant still move there. Try going back to sleep, and then pressing use only ONCE on the wake up door. Archer : I found the cause for your bug, it's because you pressed use on the bed while you were reading the diary page. Go in the console while in the house and enter the following. I will make sure this cannot happen, in the next patch. In the final battle of the prologue, these two guys are facing the wrong way when you first burst in. Has anybody noticed this yet? If not then im suprised! EDIT2: Oh my! Another one! During the prologue in the dual elites part once the cutscene starts where you walk out the scanner you are actually able to KICK yourself so the NPC dies! EDIT4: Seems like were having a massive bug hunt! This particular card is invisible when "model quality" isn't at max preset. Trash becomes flat and conceals it. Texture quality can be anything. Try this: run Underhell, set everything to max (what you can), shutdown Underhell, go to registry, edit values, launch Underhell. Also, can set r_shadowrendertotexture with "launch options" (+r_shadowrendertotexture 1). It might work, or not. So I got stuck in the floor of this elevator. Luckily there is a checkpoint before this happens. What I did to get stuck was crouch behind the crates, ride the elevator down, loading screen happens, then I'm stuck in the floor. I just reloaded the checkpoint, and waited until after the loading screen to crouch. Why is this building in the water? Oh no no no! A bug! Sometimes after beating up Tyrone, the guards will fail to spawn/open the doors, forcing you to get stuck. And you'll have to load a save. I have an issue with the inventory screen when playing on 2560x1600 resolution. The right and bottom sides of it get cut off and can't be accessed. 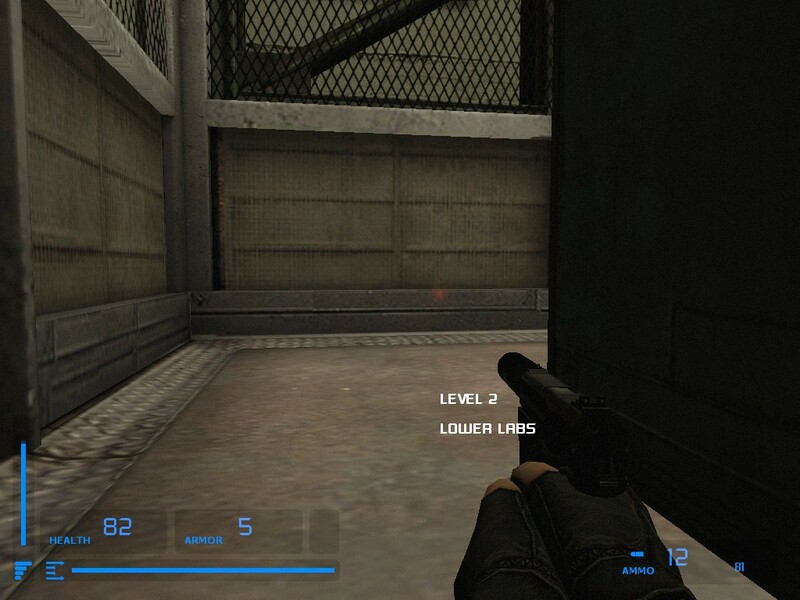 I've verified the integrity of the Source Sdk Base 2007 game cache, changed to lower resolutions and back a few times (it lines up fine at lower resolutions), and restarted the game a few times, but it just doesn't seem to want to line up correctly at 2560x1600. Is there any way to fix this? Any file I could edit somewhere? That's very sad, but unfortunately we haven't tested the UI in such resolutions, none of our monitors have those resolutions available. One of the downsides of being an indie I suppose! Decided to tinker myself and found a solution. In the \Underhell\resource\ui folder there is a inventorypanel.res file, with variables 'wide' and 'tall' set to 1024 and 512 respectfully. Increasing those each by 25%, to 1280 and 640, lets me see and interact with all of my inventory. I don't know if this is the "correct" way to fix the issue, and the inventory box is a little off center, but doing that lets it function normally with both tooltips and right clicking on items. Since I have a 2560x1600 monitor handy, if there's anything you ever want me to help test out just ask, I'd be happy to oblige. So seeing as this is the bug reports and thread for things that aren't working, I appear to be having a VERY serious bug problem with my copy of Underhell. I downloaded it from Desura, it has experienced a few crashes, but I don't really mind that. I can STILL PLAY the game with crashes. This bug, makes it impossible. You see, I'm on the part of the game when Jake has to reactivate the Multiple Generator thingy, and he has to flip 3 switches to reactivate it and finish the level. When I tried to do this, the final lever (the middle one) would not respond to me E command. So, I restarted the level and tried again, running into the same error. If the gas is removed from the Northern Wing Labs (Endgame) before Jake reads the PDA telling him to start fires, the side objective will reactivate and not be completable. so far I really enjoyed this game. Love it. But now it crashes. The crash: When I leave the shooting range to collect the pieces for the cypher and move towards the workshop, the game crashes. Every time at the same spot. Or when I take a different route, it happens when I get close to the workshop. It tried loading old saves, restarting steam and so on, but nothing changed. I did check the source2007sdk cache and it's fine. If I load an older save it crashes after some short time. 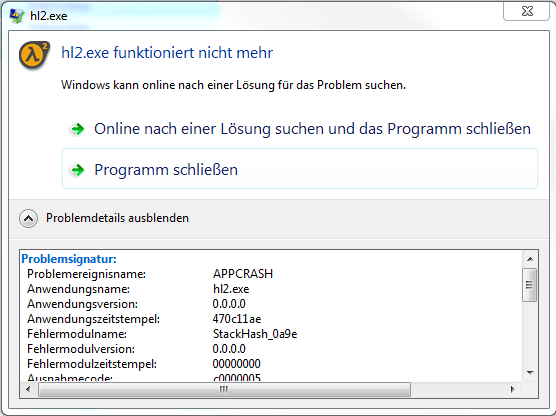 But at the next crash it looked like the first error message again. I don't have problems with other games (HL2 episode 1 for example). Can someone help me? I would love to continue playing! Unfortunately I cannot read german. Try loading an earlier save and replaying from there, let me know if that helps. Well I tried to provide as much information as possible and I guess the error codes and whatnot are the same no matter the language. Like I said in my first post, if I load an earlier save it crashes too (pretty fast). But since at my last save it will always crash at the same point (when I get close to the workshop area) I would guess it's loading something which causes the error. Just stranged that I was playing for hours and everything went smooth. Can't actually remember that I changed something. Open your Underhell_Chapter1_1.2.7z with WinRAR or 7zip. Click "Test" icon. Just to be sure. About your screenshot, in many cases, informations inside that window are useless. drwtsn32 (post mortem debugger) from WinXP is slightly better. However, after installing the mod and rebooting steam, clicking 'play' on Underhell does completely nothing. Steam recognizes the mod as it got sorted into the category and Steam showed me the last play date (September). I verified cache of all the Source SDK Base tools. I can see previous posts mentioning this, but saying thanks to a post inexistent in this forum gives me no leads for a solution whatsoever. Anyway, I just found a solution. In case anyone is going to do the same mistake I did, try to opt out of the Steam Beta and restart Steam. The mod should launch just fine then.